Some of you were curious just what secondhand toys we found. I would call this a blow-out Christmas. I can already tell that Santa bought too much. Even though I pared our toys to the bare minimum beforehand, I will likely pack half of these games away for later. For our 18-month old: about $24 total, including the $5 Radio Flyer Horse pictured earlier. 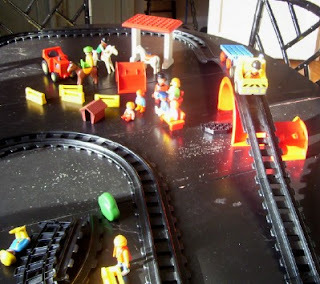 Playmobil train set/farm set ($3) is suitable for both of them. 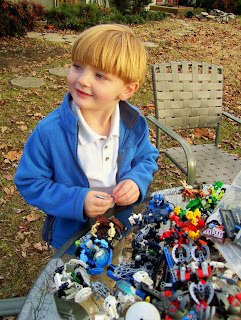 The big gift was a Batman LEGO set ($4) and a giant bag of Bionicles ($6). 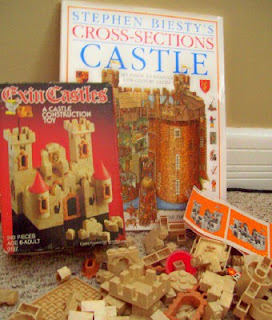 The Castle book (.50) and building set (.69) made a serendipitous pair. 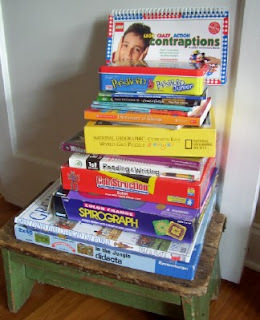 Here's the big, big stack of things to do this winter-- bringing the total to just under $27 for my five-year-old. My out-of-pocket expense was less. A $25 shopper reward at Thrift Smart made some toys essentially free. For more budget goodness, Mama Says details how a family of 9 did all Christmas--down to the ham--for $300. How about you? Did you keep track of what Christmas cost? Wow -- I applaud you! We do not have such nice thrift stores around here, but I was able to do a lot of great clearance sales and good coupons. I also shop year round, which also helps. Okay, so I am totally jealous of your totals. Overall, I don't feel we did bad. We got a Power Wheels Jeep from a friend for $25 and it looks new and I made a doll for my 2 year old, which cost next to nothing. We probably paid more for the stocking stuffers than the actual gifts. Except the $50 replacement battery for the Jeep. A Merry Christmas was had by all. I definitely spent more this year (and more than you!) but I am still proud of what I was able to get. I have to say that when kids get older they want more specific toys that are current in the stores and that makes it tough to be frugal! That was definitely the case with my 5 1/2 year old. Last year Santa brought a "gently used" huge toy kitchen that my boss gave me. I spent less than $100 on both my girls last year. I won't even venture to guess what I spent because it will make you wonder what I am doing reading a blog about frugal living!! Ok, while I am not exactly a spendthrift, I do feel like we spent way too much. I am honest when I say that after a very disappointing Christmas this year in terms of gifts/purchases/expenses, etc, I am COMPLETELY rethinking things already for next year. I am very, very impressed with how you managed to do such a modest, sensible, reasonable Christmas, Meredith, and yet still have kids who were thrilled and happy! (And the proof is in the photos!) It seems like, for the most part, kids are tired of their toys in a short time no matter what you paid for them. I have been really thinking about this over the past few days and want to become a better steward of our funds in the area of gift giving in particular. Thank you so much for sharing your totals, etc, because it gives me a benchmark to aim for in the months ahead!!! Great job Meridith! I miss the days my kids were younger and more innocent of consumerism! My expenditures on the kids (ages 7 and 3) were about $120 total, the highest amount ever. Now, don't go into shock or anything! I'm thinking that I'll bring it back down to $50 or so each for next year and probably will do a toy or two fewer and will probably add in an outfit or two. I did buy them their own note cards from a budget online provider so that I could continue their instruction in proper written social communication (i.e., invitations and thank you notes), but that was the one practical gift for each. I don't believe in beating myself up about stuff. Yes, I spent more than I'd prefer and probably wouldn't have if I hadn't been back to work full-time this year. Then again, because I also buy an equiv. amount for Angel Tree, I gave more into my community. So it's not all bitterness and recrimination! In addition to the kids, I buy for about 22 people and we host the family Christmas meal with no contributions from attendees. My total expenditures on the holiday, including food and supplies for homemade gifts, decorations, hostess gifts, baking, school events and so on was just short of $450. This is possible, I think, because 1) I shop all year, 2) I can make some gifts (that people profess to enjoy) and 3) I know how to cook and bake. I'm more concerned about what my husband spent on me (his holiday "budget" is spent solely on me and is separate from my budget). I'm totally grateful for his kindness and consideration, of course, but I do plan to have a gentle correcting conversation with him at a safely removed time - maybe April or May - about my expectations and how they are NOT what advertisers would have him believe. We did our best by shopping clearance, and I was tracking really well for quite awhile. Our expenses were less than $50 each for our two children. I did my best to keep all nieces and nephews to right around $5, but ended up spending 12 on one. I figure with all gifts, and food costs for hosting 20 people, we were just under $500. A little more than planned, but we enjoyed ourselves, and were blessed with a bonus to help cover the extra expense. Oh wow! I'm so impressed! I, too, have to agree that the older they get, the harder it is to save money on their gifts. We have 4 young nieces, and I can easily buy nice presents for them and keep the costs down. But our teenage niece is so much harder. At her age, she wants money, gift cards, or clothes from expensive stores. And anything used would NOT fly. I wouldn't even try it, frankly. I'm new at this thirfting for Christmas. But I did start in time for this year, thanks to you Meredith. Actually we all made our gifts for each other. It was one of the best exchanges we have ever had and plan on doing it next year. All our kids are older (20's) so it is alot easier for us to do. The ladies in my family recieved Spa Packages. I made Sugar Scurbs, soap, hand cream bars. All the containers came from Thrift Stores, plus the silver spoons! The ribbons that the presents were wrapped in ribbons from last year and I put all the gifts in baskets (from Thrift Stores!) Each gift truned out beautiful. One daughter was jealous until she found out that she got one also! I didn't keep track of our total Christmas expenditures, but for gifts for our 2 year old, we spent $30 on blocks from Etsy and maybe $10 on stocking stuffers (plastic animals, a flute, etc.). Like Donna, I agree that our relatives gave her far too much (clothes and books and CDs and a tea set with plastic food and some puzzles). She is confused by all this - we really downplay gifts - so I am glad to be reminded by other commenters that kids are not so easy to please as they get older. My husband and I got each other 1 gift. We really don't do multiple gifts for anybody. Oh, my, I thought I was a thrifty Momma this year, but obviously not. This is fantastic! Merry Christmas to you all. Ummm...no I didn't keep track of the cost, but I'm quite sure Christmas was between $500 and $800 this year. 2008 is my year of frugality and thrift. I'm going to try to keep it down to a low roar for Christmas next year. Meredith, I am very impressed. Your kids got some great goodies! We probably spent too much this year....but, as always, we paid cash for it. We went "dream shopping" at an electronic store, checking out digital cameras for ourselves. Glimpsing the prices, we knew we'd have to wait and save. I jokingly told my husband, "Maybe my parents will buy us a digital camera," and he said, "Yeah, right." So he got me a day planner and I bought him pajama pants and my parents....gave us a digital camera! I will encourage all of you with young children that it gets much cheaper when they are out of the teen years. (Mine are unmarried in their 20's) Ready? I spent $7 on one child and gave a free-- because of an exchange-- paperback book to the other one! Yes, that is right; seven dollars total! We all wanted to give the money to others (Christmas boxes, angel tree, a community outreach, and mostly Compassion International.) When the children grow up it truly changes,so don't feel too bad if you bought an extra toy or two. It sounds like everyone did well. I have been reading your blog for quite a while now but just now started blogging myself. This is the first comment I have left...I am so excited!! I really enjoy your posts. We have just recently started thrifting also, we were on a cash only basis this year for gifts for the first time ever! I wasn't nearly as thrifty as you but we did well for us, watching sales, using coupons, etc. It will be so nice not to have any credit card bills coming next month! I love the gifts you were able to find for your children. I am sure they will have many hours of fun playing with those things. Merry Christmas, and thank you for the inspiration! Congrats on all the great finds! You have a great eye for quality on the 2nd hand market! DH, [who is very practical and thrifty normally], goes a little nuts with electronics at Christmas. So, we had a lavish Christmas full of gifts. I did find a Royal Doulton coffee creamer with 2 cups for a thrifted gift for me from Santa ($1.50). Our goal was also to pay cash for all and not use credit cards...we met that goal. I read others comments and I have to disagree with "it gets harder as they get older". I believe it's all in the way it is presented to the older children. My 10yr old son loved all his gifts, a couple were purchased at the retail stores, the rest from thrift stores. His list was a mile long, with a Wii, 4 wheeler, and Ipod included. We discussed the unrealistic list and he pared it down himself. There were a couple smaller things bought off his list, the rest were things his father and I knew he would enjoy but had not thought of. And we were right. 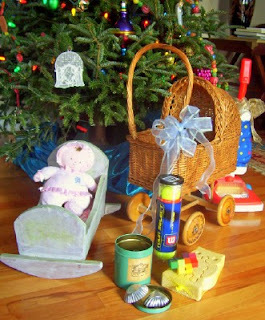 He was delighted with all his gifts, he knew most of them came from thrift stores, and he didnt care. I just wanted to tell you that I am truly impressed. I want to know how you score the thrift store sales you do. I don't know where you live, but around here, it seems like our high illegal immigrant population walks off with most of the thrift store finds. I have been disappointed. Any tips? =) Merry Christmas! We did well, but not that well! Good for you. I think I need to stockpile thrift finds and put them away for birthdays and Christmas. I just didn't have the time for it in December. The favorite gift by far was an older book on turning bikes into mechanical contraptions for 25¢. helped that the boys got new bikes from Santa so they have a garage full of old bikes to repurpose. You are simply amazing, and inspiring as always. This year I plan on year-round shopping, that's all I can say!